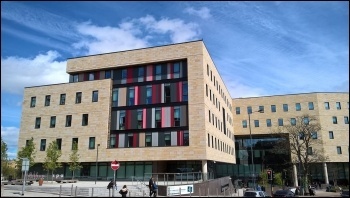 Bradford College was one of six colleges where workers took strike action for decent pay on 28-29 November. Since the Tories have been in power, pay 'rises' in colleges have been below inflation - at 1%, or even zero. This year's announced pay rise of 1% hasn't even been implemented in two-fifths of colleges! Members of the University and College Union were in good spirits on the picket line, with Bradford College's flagship David Hockney building shut for the day by the strike. At the strike rally, speakers made clear not only that college staff deserve decent pay, but that this is linked to the wider issue of further education funding. The Socialist Party fights for the reversal of all cuts. The government has slashed funding in recent years. College managements have passed on widespread cutbacks, despite high pay rises for principals and spending on new college buildings.